Thursday January 29th 1925 I spent the morning talking to a lady who with her husband live in Waverly Iowa. We went to the picture show "So Big" in the afternoon. I had letters from Hattie, Fannie, & Cora today and two papers. Spent the evening in parlor with others in the house. It is three months since Cousin Verne died. Friday January 30th 1925 I read a little and talked to Mrs Ernest. Soon after dinner went to the Fair in a taxi Letter from Lydia. Wrote Tishie Hedges. Spent evening here at house. Saturday January 31st 1925 I wrote Cora and took the letter to the office. Soon after dinner I went up to Mrs Lowe. She brought me home. Card from L.D.L. Wrote her after supper. Spent the evening with The Ernests. Sunday February 1st 1925 Mr and Mrs Ernest went away this morning. I went to SS and church. After dinner I walked up to Pickens. She came back with me to hear the band play. I read in evening. Weather delightful. 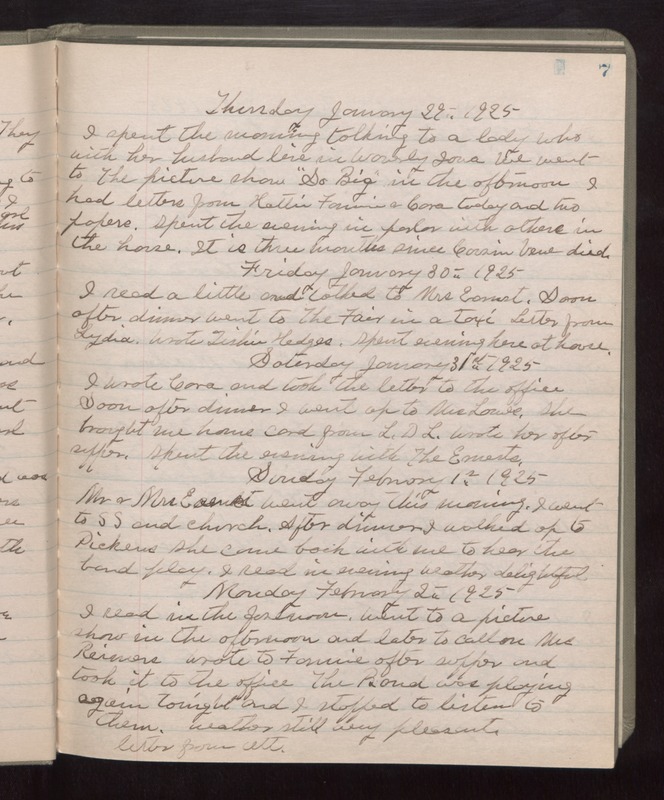 Monday February 2nd 1925 I read in the forenoon. Went to a picture show in the afternoon and later to call on Mrs Reimers. Wrote to Fannie after supper and took it to the office. The Band was playing again tonight and I stopped to listen to them. Weather still very pleasant. Letter from Ott.